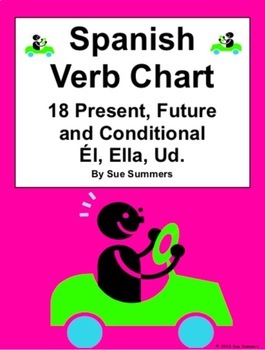 Spanish Verb Chart - 18 Present, Future and Conditional Él, Ella and Ud. This chart includes 18 common Spanish verbs, including 12 verbs irregular in the future and conditional. Students must conjugate them in the él, ella, Ud. form in the present, future and conditional. Sample verbs are haber, caber, ser, conducir, querer, hacer, poder and salir. This resource can be used as a quiz, in class activity or a homework assignment. 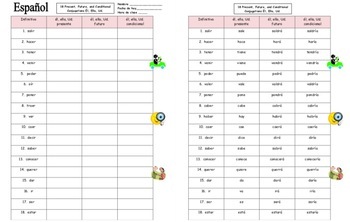 Please click here to see more of my Spanish verb charts.